And now, the story of a wealthy queen who frost everything. And her one sister who had no choice but to save them all from weather. It’s Frozen. We expect every contemporary animated movie to sport a layer of comedy just for the adults in the audience. While the kids are mesmerized by the magic and kept giddy over the screwball sight gags, the parents, older siblings, and babysitters are kept from dozing off by double entendres, relationship humor, and — most of all — sly pop culture references. The Shrek films upped the ante on this trade, and many a big screen cartoon has followed suit since. But Frozen gives us something unprecedented: numerous direct references to Arrested Development. Admittedly, they’re subtle. So subtle that I wondered, leaving the theater after my dazzling experience with Frozen (these instances aside, I absolutely loved it, as did our reviewer Hans Morgenstern), if I was just reading too deeply into a few innocent gags. But right behind me out of the auditorium were two men about my age dicussing the very topic that was haunting me. “Did you notice all the Arrested Development jokes?” one said to the other. That’s proof enough for me. So here they are. Early on in the story, the Scandinavian town of Arendelle is invited inside the new queen Elsa’s (Idina Menzel) palace walls to attend her coronation party. This is when we meet Alan Tudyk’s obnoxious autocrat, the Duke of Weselton — the character responsible for a good supply of Frozen‘s villainy as well as the first and third Arrested Development references. 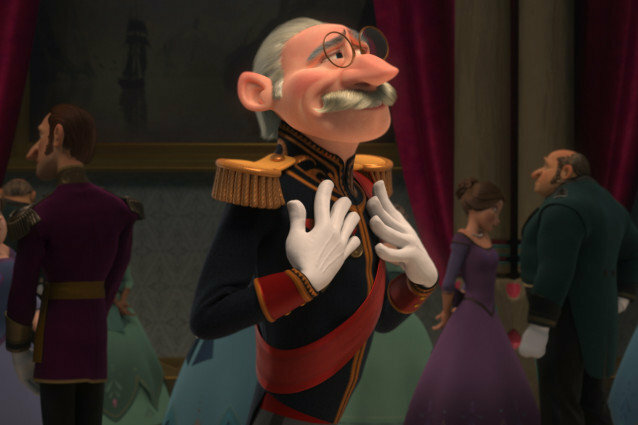 The Duke insists upon a dance with Elsa’s sister, Princess Anna (Kristen Bell, the hero of the piece), bouncing around her in an animalistic fashion… one of which he is well aware. The Duke boasts openly about his feral rhythm, likening his movements (with pride) to the graceful chicken. But as he delivers this line, the Duke takes a posture that doesn’t quite resemble that of any ordinary chicken… with his fingers fanned out atop his head and his legs jutting to either side, the Duke’s chicken is almost identical to that dreamt up by one Lindsay Fünke in her rendition of the Bluth family Chicken Dance. Could it be that a pattern is amounting, or is this just wishful thinking? Maybe I didn’t catch the Duke’s chicken dance quite right, allowing my AD fandom to inform how I interpreted his quick movements. And sure, that sandwich gag might have originated on Arrested, but I seem to recall its subsequent adoption by other comedic entities (Community, for one, subbing out “sandwiches” in favor of “pie”). I was teetering on the edge of believing that Frozen could, in fact, be fostering a running gag for Arrested Development devotees. At this point in the film, all I needed was one minor gust of wind to force me over. And then it came. “She’s a mooonsteeer!” Yes. Once recognizing the powers of creating snow that lived within Elsa, the nefarious Duke belted this condemnation in a tone a little too reminiscent of one self-loathing, hook-handed Buster Bluth. And it was so. It couldn’t all have been an accident. The last AD nod I noticed was, admittedly, the flimsiest. Fleeing the wrath of the frightened and enraged townspeople, Elsa sprints away over a liquid lake that freezes upon her contact with it. If it weren’t for the three preceding gags, I wouldn’t have entertained the thought that this might be a reference to Rita Leeds’ (Charlize Theron) illusionary stroll across the surface of a swimming pool and her cinematic brainchild The Ocean Walker (itself all a reference to the ’79 film Being There). I’ll give you that this one is quite a stretch… but the other three? All in such rapid succession? You’re gonna tell me that those aren’t Arrested Development references?